I'm so excited, and I just can't hide it. Neither can my belly button, because it's literally trying to escape it's way off of my body right now!! We officially made it to the third trimester, and I can't even handle my excitement to almost be done. It's insane how fast the second pregnancy moves, but I can't say i'm complaining. Pregnancy is not my jam. What is, however, is this super cute maternity cardigan that I can't stop wearing with everything! You all know from my last pregnancy, PinkBlush Maternity is my go to for the cutest Maternity Clothes and not much has changed this time around. 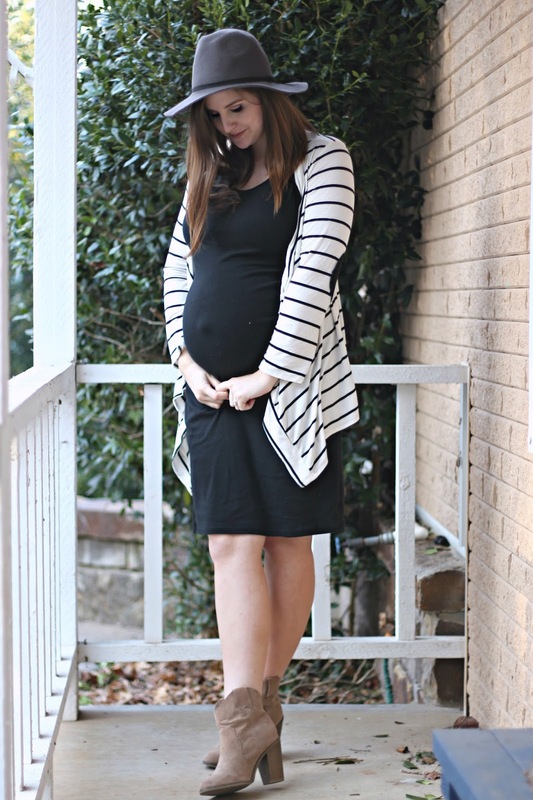 I love how light this cardi is, and how it can easily be warn after this little lady is born! 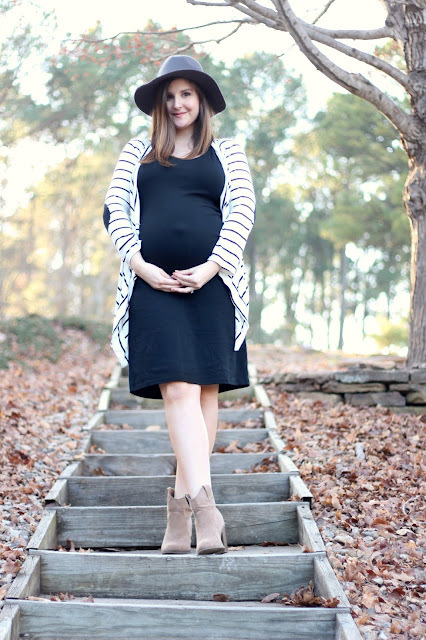 I wanted to pop in for a 28 week bumpdate, but because i'm so excited to be inching closer to our May due date, i'm giving away a $75.00 gift card to PinkBlush and all you have to do is fill out the rafflecopter after my bumpdate! This isn't just for you expectant mamas, either, PinkBlush has an adorable clothes for anyone, expecting or not! Total weight gain: I'm not totally sure, but I know i'm packing on the pounds lately. I won't lie, i've sort of been stuffing my face, and there have been a few pictures of me lately that I see and say "NO. I DO NOT LOOK LIKE THAT" So i'm going to do my best to reel that in in these remaining weeks. Fingers crossed breastfeeding is the best exercise this time around like it was with Sawyer! Stretch marks? I'm not sure if I have any new ones, but my belly has been crazy itchy lately so i'm guessing I have some on the way. I'm more convinced than ever that stretch marks are genetic, because i've used every oil and butter in the book this time around, yet I still see a few forming. Best moment this week: We have been enjoying the best weekends. The weather has been fantastic, we're all FINALLY healthy after what felt like months of colds and sickness, and this last weekend we had all of the windows open, and it felt like Spring. I am loving all of our outside time with Sawyer, and welcoming the warm, comforting weather. Movement: Little lady on the move! Lots of movement every day, which is my favorite part of pregnancy. Jake loves to feel her rock and roll and after her 4D ultrasound last week, it's interesting to see where she actually is in my belly. Food cravings: Chips and Salsa has sounded good to me every single day lately, but other than that no real strong cravings. I always have a sweet tooth so unfortunately I can't blame my overindulging on our little one. Anything making you queasy or sick: My one year old has some diapers that really rock my world, but other than that, i'm good ;) I have had horrible acid reflux this pregnancy, so I live off tums and if I don't take them I start to feel pretty queasy, but for now, most of that has passed. Gender: Our first little gal! Triple confirmed at last week's ultrasound. ;) I still can't even believe we're having a girl, so every time we have a sonogram I make them check. Labor Signs: Last week I was having crazy braxton hicks. Like, I was almost afraid I was going into labor. At one point we timed them and I was at 7 in an hour. They weren't really painful, just incredibly tight and uncomfortable and I felt like I was having them constantly! I went to sleep and they never returned, though, so for at least the next 10 weeks this gal is locked down. Symptoms: I seriously feel so blessed that I haven't had any rib pain this time around. That was probably the most brutal part of my last pregnancy. I'm knocking on wood as we speak because i'm terrified of having it again! I carry babies pretty low, and it already feels like her head is on my cervix so that makes walking sore and uncomfortable, but i'm feeling pretty great other than that. I had to travel for work last week and it about wiped me out. I forget how exhausting being on your feet all day is! Belly Button in or out? As you can see in the pictures above, my belly button wants off of my body. Sawyer loves it. In fact, it's how we taught him where his button was and he now loves to lift everyone's shirt up to take a peek at their button! My umbilical hernia seems to be getting much more extreme as the weeks go on, but luckily, isn't really painful so i'm ignoring it for now. Happy or Moody most of the time: So, so moody. It's exactly the opposite of how I felt with Sawyer, really. The other night, Jake came home and I was just pissed off. Who knows why. He asked what was wrong and I said "i'm just SO hungry and there is nothing to eat here" poor guy literally named every restaurant in the county and I shot everything down. So he made me some roasted potatoes and I went to bed. He really is a pregnant husband trooper!! Looking forward to: SPRING! Because our little girl will be here, and also because the weather is amazing and I can open up all the windows and enjoy living at the lake. Maternity leave starts in like 75 days and not that i'm counting down (i'm totally counting down) but i'm really looking forward to some time off. Even though maternity leave is far from a vacation, work has been so insane lately that I can't wait to take a mental break from it. We're also taking a long weekend to take our little guy up to the Tulsa Aquarium this weekend and I can't wait to see his face light up at all the colors and fish! I've been meaning to blog some nursery progress for weeks now, but haven't gotten around to it, so make sure you're following along on snapchat @absolutelykylie to see how far we've come! Now for the giveaway ;) Just follow the instructions in the rafflecopter below for your chance to win! The giveaway will run until Friday, and i'll announce the winner then!